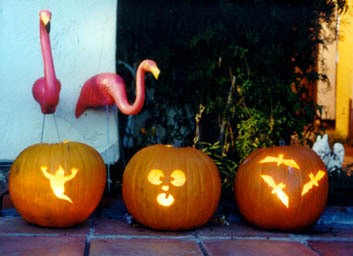 Here's some favorite recipes of mine for the Halloween/Thanksgiving/Christmas holiday season. My favorite is the Pumpkin Pie—it's not the bland, plain type found in stores. Makes 2 pies (12-16 servings). 2 9-inch unbaked pastry shell (1 1/2 inch deep). Variation: for an exotic and sweeter pie, use a store-bought Graham cracker shell. Combine butter and brown sugar. 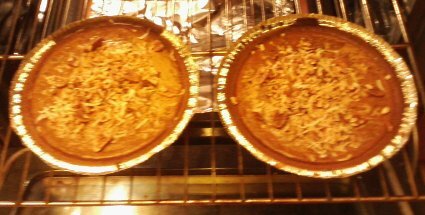 Add chopped pecans and 1/4 cup flake coconut. Mix well. Press mixture firmly into bottom of pastry shell. Combine eggs, sugar, salt, ginger, allspice, cloves, nutmeg, cinnamon, pumpkin, and evaporated milk, blending well after each addition. Poor pumpkin mixture over brown sugar mixture. Bake at 425°F. for 15 minutes. Reduce temperature to 350° F. and continue baking 40-50 minutes, or until knife inserted into center comes out clean. Garnish with toasted coconut and pecan halves, if desired. Serve warm or cool. Preheat oven to 350°F. Mix raisins and nuts and soak in apple juice. Mix flour, baking sobaking soda, baking powder, salt, cinnamon, nutmeg allspice, and cloves. Beat eggs. Stir in sugars, oil, and pumpkin. Stir in dry ingredients. Add raisins and nuts. Pour into greased 8x4-inch pans. Bake 60-70 minutes. Knife stuck in center shouldn't come out sticky. Cool 10 minutes in pans. Cool 10 minutes in wire racks. In a large mixing bowl, cream shortening, sugar and vanilla. Add eggs one-at-a-time, beating until smooth. Stir in pumpkin. Sift together flour, baking power, baking soda, salt, cinnamon, nutmeg, allspice, cloves, and ginger. Stir dry mixture into pumpkin mixture in four parts, alternating with water. Do not overbeat. Fold in nuts. Pour into a greased 9x5x3-inch loaf pan. Bake in a preheated 350° oven for 45 - 50 minutes. Garnish with toasted coconut and nuts, if desired. Sift flour, sugar, baking power, salt, cinnamon, and nutmeg into medium bowl. Combine egg, oil, pumpkin, and evaporated milk. Mix thoroughly. Make a "well" in flour mixture. Pour pumpkin mixture into well. Stir just until dry ingredients are moistened. Spoon into 12 buttered muffin cups. Place 1 teaspoon marmalade on top of each muffin. Bake at 400°F. 20 to 25 minutes. Remove from pan immediately. Place on wire racks to cool. Another comprehensive pumpkin web site, including tips on growing pumpkins. © 1994-2010 Daniel Anderson. All rights reserved.